Woooo, I'm finally back! heheheh. I've been busy, but can't complain about that, life has been good. This week I took my friend from Switzerland around town, it was nice, but it does make you tired to walk around all day. We were lucky though, it was a beautiful day and we were able to go to several places, which was a lot of fun. My kitchen is not completely done yet, but it's functional now. After a little over 3 weeks, I'm able to cook again. It's kind of fun to eat out every once in a while or eat microwavable food occasionally, but when you are stuck with that for 3 weeks things get ugly... lol. I gotta say that I am very fortunate to have a handy husband, he has been doing all the work on his own and it's looking great. ** Pictures will come soon when the kitchen is completely finished. On the craft side of life, I have also been busy... 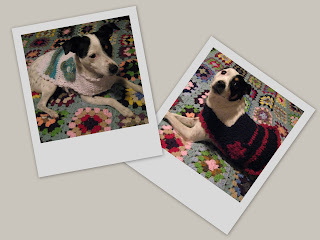 I'm working on a very time consuming tank top that I intend to submit for next year's fair, but I get bored of doing the same thing every day, so I do little projects in between, like these pet sweaters (pictured). Anyhow, that's about it for now... gotta get ready for work!